Shoulder dislocation with greater tuberosity fractures (GTF) is becoming increasingly common, as is the number of cases of iatrogenic humeral neck fractures (IHNF) during reduction. 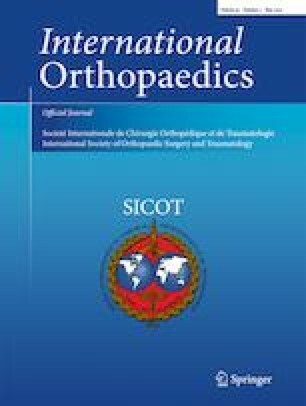 This study investigated the relationship between size of greater tuberosity fragment and occurrence of IHNF in patients with shoulder dislocation and GTF. A retrospective study was made to identify all patients presenting with shoulder dislocation with GTF between September 2014 and July 2016. There were 74 patients with an average age of 52.4 years (range 18–84 years) representing 76 cases of shoulder dislocation associated with GTF. Patient age, injury mechanism and location, treatment waiting time, and reduction method were noted. Using conventional anterior-posterior view radiographs, three points were identified as A, B, and C. Distance ratios between AC and AB were calculated, then the resulting ratio was compared to a critical value of 0.4. More iatrogenic fractures occurred in cases where the AC/AB ratio exceeded 0.4. Most (13) occurred during emergency Hippocratic manual reduction. Only five of 18 iatrogenic fractures (27.78%) occurred during surgery while under traction. Women ran a higher risk of iatrogenic fracture than men (female/male ratio 8:1). On average, women were older than men at the time of fracture (59.75 years for women vs. 42 years for men). A statistically significant relationship exists between size of greater tuberosity fragment and occurrence of iatrogenic humeral neck fractures during the reduction of shoulder dislocation. The larger the greater tuberosity fragment, the higher the incidence of iatrogenic humeral neck fractures. For such fracture dislocations, we recommend open reduction with internal fixation directly and using a Kirschner wire in advance to reinforce the proximal humerus before reduction of the shoulder. Proofreading and revision services were provided by a professional editor. Junfei Guo and Zhiyong Hou designed the study. Junfei Guo and Lin Jin collected the data of the study. Junfei Guo drafted the manuscript. Yingchao Yin, Yueju Liu, Zhiyong Hou, and Yingze Zhang revised the manuscript before submission. All authors read and approved the final manuscript. This study was approved by the institutional internal review board of the participating institution.